boom,buckets,log grab,scrap grab,grapple,quick hitch etc. 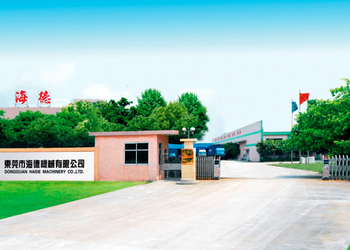 Our company has a machinery industrial park taking up an area of 45000m3. In international market,we have supply our products to more than 30 countries. 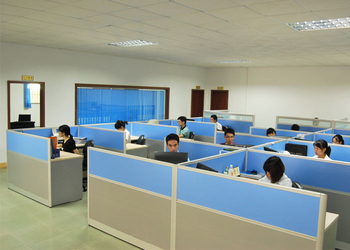 professional service to our customer,and also can improve our core competitiveness. 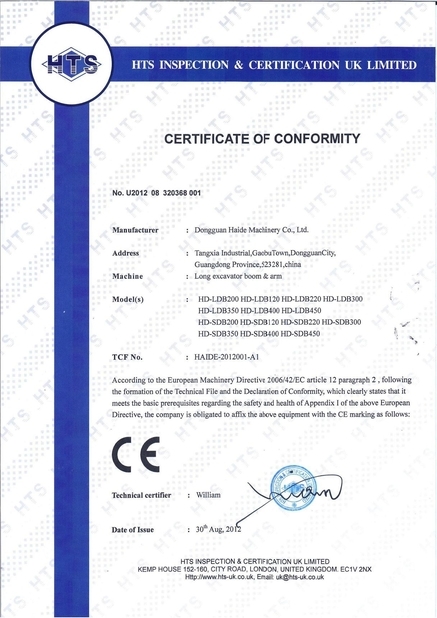 Dongguan Haide Machinery Co.Ltd was established in 2006. - 10 years experience in Wearhouse equipments. - 7 years experience in Excavator long reach boom and Excavator attachments. 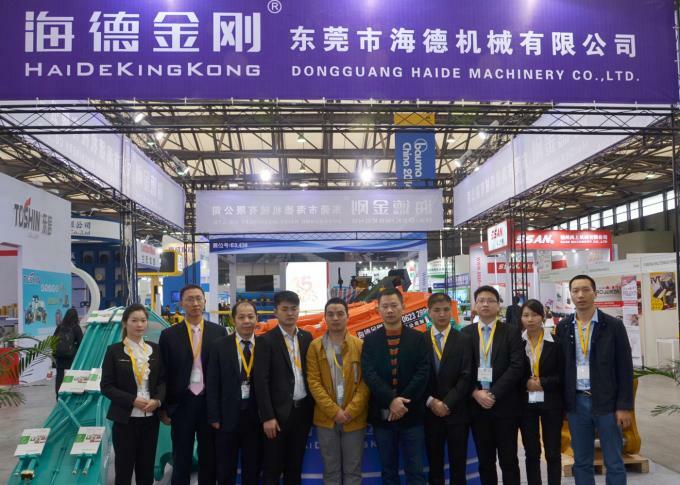 >> 2006,Dongguan Haide Machinery Co.,Ltd was built,mainly manufactured and sold wearhouse equipments,such as dock leveler,yard ramp. >> 2008,at the end of this year,after about 3 years development,Our CEO find that the profit margin of wearhouse equipments was reducing every year,in order to make company developing very well,must considering diversified development. >> 2009,Our company developed another field,new business have little relation with prior business(big steel structure),mainly customize long reach boom and buckets for excavators.Main market is our domestic market. >> 2010 ~ 2013,We developed lots new products in excavator field,gathered lots of feedbacks from customers,did lots of improvements for our products. -In the end of 2011,we build our international sales-dept. 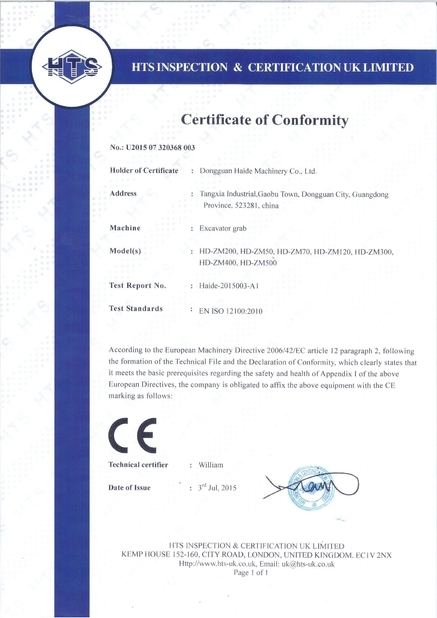 -In 2012,we get ISO9001:2008 quality system certification. >> 2014,we developed new products,such as multi-processor(demoliton tools),vibrating ripper,etc.Keep improving of Telescopic boom. >> 2015,our sales-proportion of international market was 50%. 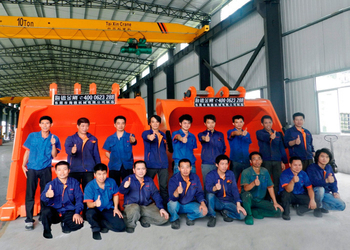 -Customize long reach boom,high reach boom for all kinds of excavators. We have detailed dimension of most excavators,just give us the exact excavator model is ok,such as Komatsu PC200-7,Hitachi ZX200-1,Doosan DX225,etc. Before manufacturing,we usually show the detailed dimension drawing to customers. -Customize dock levelers and yard ramp for customers. For dockleveler,we can customize all kinds of dimension docklevelers,usually just give us the pit dimension is ok.
For mobile yard ramp,we can customize yard ramp as customer requirements. -We supply detailed parts list for all the products we supplied.Customer just give us the parts No.,we can delivery the right parts for maintainance. -If our products have problem,show us the details of the problems,we will supply the best advice to help solving problems. -We hope build longer dealer-ship and sign agreements in international market. -For the products we supply,we can stick dealer's logo. Customer Centered,Best after-sales service,Technology Innovation, Continuous Improvement to provide better and better services to our international customers.